I was delighted to receive an email from Sheila’s son David, who heard about GGSTEM and decided to help his daughter make a video asking her grandmother about her work. This post includes a link to that video, a post from Sheila and then a Q&A with David about the process of creating the video. This is our first GGSTEM video submission. I hope it will inspire others! 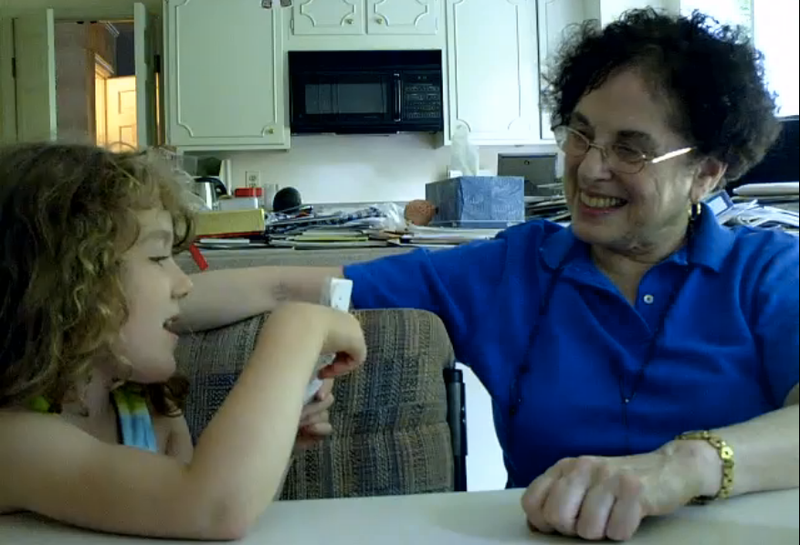 Click here to see the video of Sheila Taube being interviewed by her granddaughter, who would like to honor her as both a grandmother and a scientist. I was born in New York City. Even in elementary school I was fascinated by biology, and in the fifth grade I began thinking about becoming a doctor. I qualified for Hunter College Junior High School, an all-girls public school for gifted students. This provided an opportunity to learn more chemistry, physics, and math than I would have if I had gone to the neighborhood junior high school. After high school in Providence, Rhode Island, I went to Brandeis University, where I received my B.A. in Biology. I then went to the University of Pittsburgh School of Medicine, where I earned a Ph.D. in Microbiology. Along the way, two mentors — my college advisor and my Ph.D. advisor — had major impacts on my pursuit of science and on my success. My college advisor’s ability to impart the excitement of the hypothesis‑testing approach to scientific thinking and discovery enhanced my ability to critically evaluate data and enabled successful research. My Ph.D. advisor taught me how to effectively communicate research findings both to other scientists as well as to lay audiences. The fascination with biology, the excitement of discovery, and the ability to convey the importance as well as the excitement with clarity have all enabled me to succeed in my career. I spent the majority of my career at the National Cancer Institute, part of the National Institutes of Health. I was Chief of the Cancer Diagnosis Branch and then Associate Director of the Cancer Diagnosis Program. The Cancer Diagnosis Program has the major responsibility for developing initiatives to capitalize on the explosion of new information from the human genome program and the emergence of powerful new technologies to examine cancer cells. In addition the Program is responsible for creating an infrastructure of resources that facilitate research; this includes development of specimen resources for research. There were few women role models in the 1960’s when I began and little infrastructure that could facilitate dual‑career families. My husband and I had to create our own infrastructure and make many compromises to allow both careers to progress and the children to be raised successfully. I joined the Committee on the Status of Women Microbiologists and worked on development of programs to help women scientists understand professional options and how to approach job decisions as they pursued scientific careers. Balancing family and career has always been a non‑trivial pursuit. In my case, I believe I could not have managed to raise two children, now both professionals, and pursue my career without the active support of my husband. Here’s my Q&A with Sheila’s son David. 1. How did you find GGSTEM? 2. What inspired you to make a video with your mother and daughter? We wrote the questions one evening at dinner. Mainly, we asked my daughter to think of questions to ask. My wife and I “suggested” some questions, too. 4. How many takes did you do? (1 rehearsal and 1 take)? Yes, just the one rehearsal and the one take. There was no editing. What you see is exactly what happened for five minutes in my mother’s kitchen. 6. How long did the whole process take? The process was quick. We spent a few minutes at dinner writing questions. Then we spent about two months trying to find an opportunity to actually sit down and film the interview (plus the five minutes I spent at Best Buy purchasing a tripod). And then the whole filming process — set up, testing, rehearsal, single take — lasted maybe 15-20 minutes. 7. I was curious why she stuck her tongue out near the end — maybe she was nervous? Maybe she has had some less-than-positive experiences with science? There was no reason for the tongue thing. It’s just something she does sometimes. I don’t think she has had any bad experiences with science. So far, both she and her brother enjoy science okay. But, aside from my son’s brief obsession with astronomy a couple of years ago, neither child has really been captivated by science, either. 8. If you were to start the process over, is there anything you would do differently (advice to parents who might want to try this). That’s an excellent question, but I’m not really sure how to answer. In retrospect, it might have been more fair to my mother to send her the questions in advance, to let her develop answers. Also, I would like to have prepared my daughter better, so that she could understand the process and engage in it more. But I don’t have any recommendations about how to do that; even if I did it all again, I’m not sure what else I could do to illuminate things for her. 9. What is your favorite part of the video? My favorite part is around 0:31, when my daughter asks what “diagnosis” means. She ad libbed that question, and it was the moment when she seemed most committed to the project. Unfortunately, there was another good moment that didn’t get captured. One of the questions we prepared was, “Did anybody ever tell you that you can’t do science because you’re a girl?” We went over that question in rehearsal, but somehow we overlooked it in the actual take. My mother’s answer was that she was never told that (which I guess is a testament to the highly progressive environment in which she was raised and educated), but she did have a professor in college who did not want her to get married, because it was essentially inconceivable at the time that a woman would have both a family and a scientific career.